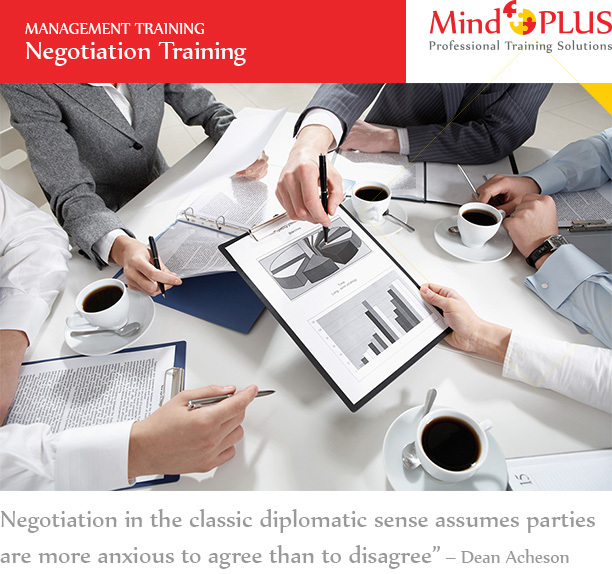 This course covers a wide range of topics such as negotiation strategy, game theory, psychological tactics, human emotional states, bargaining and so on which prepares delegates for a variety of situations that require negotiation. Case studies and scenarios such as business to business negotiations, sales scenarios and product presentations are provided along with slides, animations and illustrations that better help to show how bargaining tactics are played out. Real world negotiation examples are examined in detail and delegates are then asked to participate in similar setups to use the negotiation principles discussed in the course. Comprehensive step-by-step instructions are provided for trainers to help delegates understand the core principles of negotiation and monitor their progress through practicals. Designed with case studies and exercises from the outset to help delegates master the negotiation skills during the course as quickly as possible. Course Duration: 1 or 1.5 days. The course contains a lot of content and many practical exercises that can easily be extended to cover more than one day.